Get the best scissor fobs and needleminders made only for YOU! You can customize them with your favorite colors, charm of your choice and even put your name (or any name) on it. Have a favorite photo of a pet, child, or grandchild that you would love to be able to look at when you are stitching? Take that photo and get your own personalized needleminder! These scissor fobs are attached to the end of your scissors to make them easier to grab (plus they add a little beauty to the scissors). 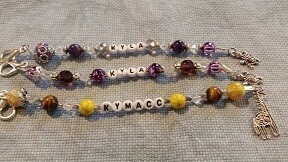 You can have ones like these made personalized with any name or word you want with the color beads you want by visiting Fae’s Crafty Creations. If you cross stitch, you can never have enough bags! (Am I wrong? I don’t think so! LOL) Below you will see all the different cross stitch bags I can customize just the way you want them! If you have not done so already, please visit my Gallery of Fabrics to see all the fabrics I have available (I have a lot). 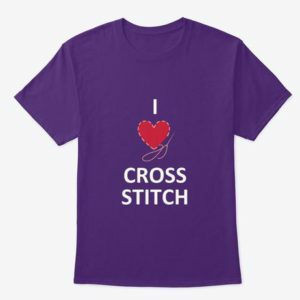 But if you don’t see anything you like, please send me an email to fae@luv4crosstitch.com and let me know what you are looking for and I will get it for you. I hope to have my store up and running here soon, but in the meantime if you want to order something, you can either email me or visit my Facebook group Fae’s Crafty Creations. How many WIPs (WIP = Work In Progress) do you have going that have been just sitting somewhere waiting it’s turn to be picked back up again? Are they protected from dust and dirt? These bags are a great way to keep those WIPs and all the materials together and dirt free until you pick it back up again to work on it. This customer loves Wonder Woman so she asked to me to make a cover to match. The standard size I make them is about 13×13 (33.02 x 33.02 in cm), but I can customize that size to be bigger or smaller. These bags are $18. 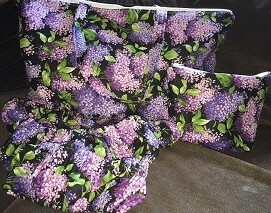 I also can make tote bags and smaller accessory bags. Tote bags are great for putting your sittching in to take with you on the go. If I know I am going somewhere that I will be sitting for a while with nothing to do, my stitching is with me! Here is a set I did for a customer. I can also take a favorite photo and put it on a tote bag that you can take with you everywhere and show off something you are proud of such as a pet, grandchild, child…etc. I can take any photo and put it on a bag. 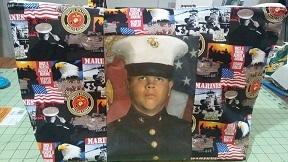 Here is the one I made that has my sons on it that I can take with me everywhere I go and show my pride and support of my sons and our military! I recently started offering a new service that I call “Brag Bags”. Who doesn’t have something they love to “brag” or talk about? Whether it be their children, grandchildren, pets or maybe even about their hobby? I personally love to brag..err..I mean talk about my children. Especially my two oldest who are in the military. So I decided to make a bag that I can use to take with me out and about for whatever I need it for. I took it out the other week and got a few comments on it. And so I got to “brag” and be the proud mom for a few minutes! 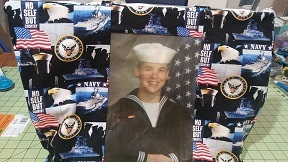 And my Sailor on the other side…. I think the next bag I make for me will be a collage of my favorite pictures of all my boys. Hmmm…wonder how many pictures I can fit on each side? 🙂 I will be sure to post that one when I get around to doing it! 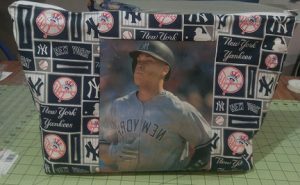 Here is a brag bag that I made for a Yankees fan. The standard size of the tote bags are about 19×15 inches (48.26 cm x 38.1 cm) but again, I can make them any size you want. 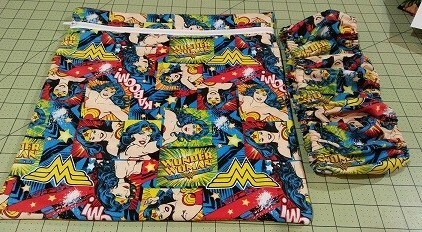 The standard size are $30 or $35 if you want an inside zipper pocket for storing your scissors and other small items. The standard size of the accessory bags are about 8×7 inches (20.32 cm x 17.78 cm) and are $15. I can also do bags for scroll rod frames. The cost of these will depend on size needed, starting at $30. If you want a photo(s) put on a tote bag (or even a project or accessory bag) the cost would be $40 for picture on just one side, $45 if you want pictures on both sides. This is a bag I did for a scroll frame. Depend on the size needed, the prices will vary so will need to contact me for a quote. You are probably thinking, “what the heck is an Ort box?” Once again, something I never knew about until I was given one as a gift at one of the retreats I hosted. What do you do with all the excess threads you cut as you are stitching? I used to put them in a little pile on my stitching table to be thrown away later, but between the time I put them there and the time I got to throwing them away, some of them wound up on the floor and then tracked to other places. Now I have one of these boxes that solves this problem. They are collapsable and can be tucked in your stitching bag and used on the go! These are $5. 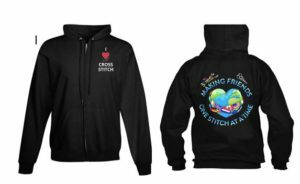 To place an order you can either go to my Facebook Group Fae’s Crafty Creations and request to join or email me your request at fae@luv4crosstitch.com. You can also feel free to message me on Facebook at Fae Kuhn. My recommended way would be to join my group so you can see more of what I have made in the past and you can also look in my photo albums to see the fabrics I have available.